So colorblock is kinda making a comeback this Fall. I've been seeing so much of it lately from sweaters (like this one) to scarves and ponchos! So we are doing something fun and a little different this week on the blog. We are doing a week of sweaters since it's finally sweater weather!!! Yesterday Katey did a super cute blouson sleeve sweater in a bright magenta color that comes in 3 other colors. But today I want to talk about the colorblock trend that is around this Fall. I've linked some other great colorblock sweaters and pieces below that you can click to shop. 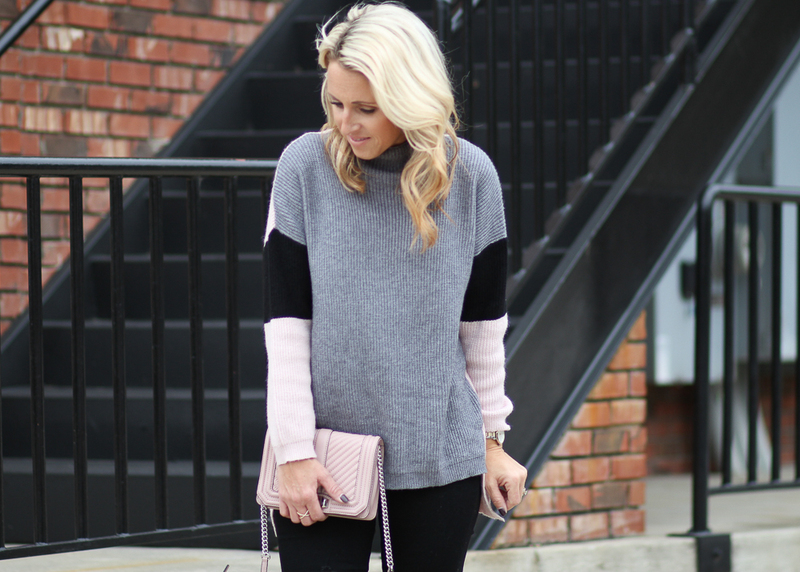 I love the mix of colors in this sweater with the blush, grey and black. It's always such a pretty combo. And these are the black jeans I shared on our stories over the weekend. I highly recommend them. They are a great fit with not too much distressing and are only $64. I am wearing my normal size for reference. What a chic sweater. Perfect pairing with the pretty ow slide mules. I love grey.